Home » Local News » SPIED: Nissan Livina facelift spotted in Malaysia! SPIED: Nissan Livina facelift spotted in Malaysia! Some interesting spyshots to start off the week, and this time it’s by yours truly. I was heading home to Rawang over the weekend when I spotted a car wearing trade plates and black tape, which was a cue to whip out my DSLR (which is why the pics are of decent quality) and start snapping. Heavy traffic didn’t help my pursuit though, and these are the only two pics I managed. Still, it’s enough for us to tell that it’s the facelifted Nissan Livina undergoing local testing. We first showed you leaked pics of a refreshed Nissan Livina from China in December last year, and this purple test mule looks similar to that car. Here’s why. 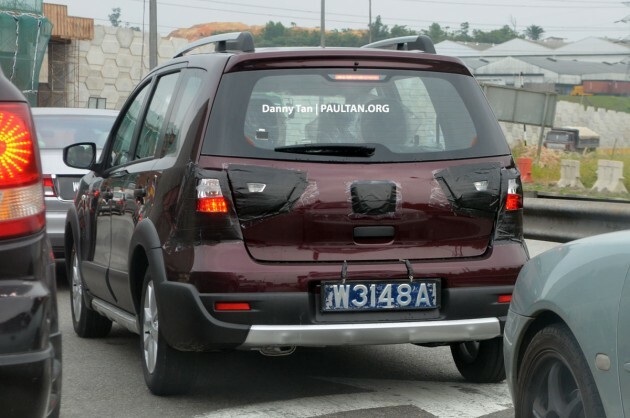 The mystery car is obviously a shorter Nissan Livina with SUV-style add ons – launched here in 2011 as the Livina X-Gear – but with black tape on the tailgate, covering part of the tail lamps. The original X-Gear, like the seven-seater Grand Livina, doesn’t have tail lamps that wrap into the tailgate. The Nissan Livina facelift spotted in China has such an arrangement. In addition, the taped up logo (we can see the outline of the Nissan emblem) sits on a squarish plastic base, as opposed to the curved item on the current Livina X-Gear. The Grand Livina doesn’t have this black plastic base for the logo. So yes, the facelifted Nissan Grand Livina is coming to Malaysia, along with its shorter X-Gear sister. After some nosing around, we’re speculating that the refreshed MPV range will debut by the end of this year, earliest. Click on the pics to enlarge. Nobody wants to buy Nissan anymore after the big boss came out in support of high taxes and car prices. People have not forgotten. Most of the potential Teana customers have come to buy Toyota because they kknow Toyota RV is so much better than old man image Nissan. He dont said about supporting high tax. But he said about reducing tax will effect the value of the secondhand car. Gov need a right formula to reduce the car price including the tax because its will effect all. U mean that Camry is for young men? came on both r uncle and bad RV. Facelift again, boring. Waiting for the all new Nissan Note. the one in China looks very similar to Exora front, and the back looks like Sportage. not interesting enough. better get Exora for MPV, or get CRV for SUV. will new GL come with 1.6L CVTC engine & CVT gear box? exactly…was wondering how many really bother bout this point A to point B car. “GRAND” Livina in Malaysia, is nothing to be grand about. Nothing grand about comfort. nothing grand about luxury, nothing grand about spaciousness, nothing grand about performance…. Might as well stick emblem “”Super Duper” Livina, if that is the case. Btter buy new face lift honda freed..
Somebody will care about this car. Many peoples dreaming to get the car. ‘Many peoples’ is an overstatement. Replace ‘Many’ with ‘Some’. And the X-Gear comes with the underbody cladding, as seen in the images. There is also the black plastic mould around the wheel arches and the side sills, so I’d reckon the X-Gear FL, and not the Grand Livina FL will be coming. Yes sir, all of us can see that it’s a Livina X-Gear! The Livina X-Gear and Grand Livina are sisters, and both should receive this facelift at the same time. This will be a much more comprehensive refresh than the minor one TC rolled out for the GL in 2011. Ah I see. Well that makes sense. well I do hope after this facelift there will be an all new model for the Livina line. What the fuss about this car anyway? This will be my second choice if I were to purchase a small SUV, of non-national made (of course, first choice would be the Honda Jazz). Judging its reasonable price and reliable Nissan engine, it could easily remain as one of the best seller in its category. What worries me is that the soon-to-launch Note appears to be more attractive than this model, so I will still adopt a wait-and-see attitude first before deciding on any models. I think the word you are looking for is hatchback, not small SUV. went 2 c vw cars last weekend.. this car is d twin of vw cross touran.. plan 2 buy a new car this year but cars r so expensive.. rm167k for cross touran, crazy!! Still waiting for Juke n New Sylphy.